Reading and share top 17 famous quotes and sayings about Valour by famous authors and people. Browse top 17 famous quotes and sayings about Valour by most favorite authors. 1. 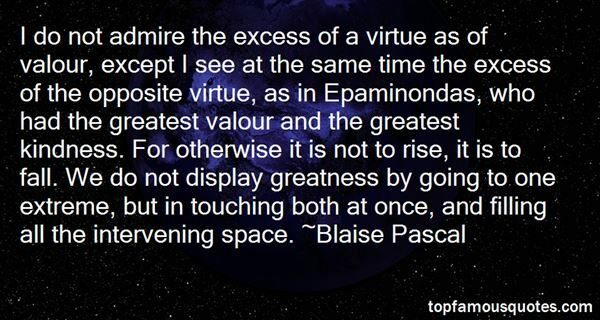 "I do not admire the excess of a virtue as of valour, except I see at the same time the excess of the opposite virtue, as in Epaminondas, who had the greatest valour and the greatest kindness. For otherwise it is not to rise, it is to fall. We do not display greatness by going to one extreme, but in touching both at once, and filling all the intervening space." 2. "Oh, I am so sick of the young men of the present day!" exclaimed she, rattling away at the instrument. "Poor, puny things, not fit to stir a step beyond papa's park gates: nor to go even so far without mama's permission and guardianship! Creatures so absorbed in care about their pretty faces, and their white hands, and their small feet; as if a man had anything to do with beauty! As if loveliness were not the special prerogative of woman—her legitimate appanage and heritage! I grant an ugly woman is a blot on the fair face of creation; but as to the gentlemen, let them be solicitous to possess only strength and valour: let their motto be:—Hunt, shoot, and fight: the rest is not worth a fillip. Such should be my device, were I a man." 3. "Nothing of real worth can ever be bought. Love, friendship, honour, valour, respect. All these things have to be earned." 4. "Active valour may often be the present of nature; but such patient diligence can be the fruit only of habit and discipline." 5. "The Windhover To Christ our Lord I CAUGHT this morning morning's minion, king- dom of daylight's dauphin, dapple-dawn-drawn Falcon, in his riding Of the rolling level underneath him steady air, and striding High there, how he rung upon the rein of a wimpling wing In his ecstasy! then off, off forth on swing, As a skate's heel sweeps smooth on a bow-bend: the hurl and gliding Rebuffed the big wind. My heart in hiding Stirred for a bird,—the achieve of; the mastery of the thing! Brute beauty and valour and act, oh, air, pride, plume, here Buckle! AND the fire that breaks from thee then, a billion Times told lovelier, more dangerous, O my chevalier! No wonder of it: shéer plód makes plough down sillion Shine, and blue-bleak embers, ah my dear, Fall, gall themselves, and gash gold-vermillion." 6. "A time may come soon," said he, "when none will return. Then there will be need of valour without renown, for none shall remember the deeds that are done in the last defence of your homes. Yet the deeds will not be less valiant because they are unpraised." 7. "I will vouch for him before the seat of Denethor,' said Gandalf. 'And as for valour, that cannot be computed by stature. He has passed through more battles and perils than you have, Ingold, though you be twice his height; and he comes now from the storming of Isengard, of which we bear tidings, and great weariness is on him, or I would wake him. His name is Peregrin, a very valiant man.' Man?' said Ingold dubiously; and the others laughed. Man!' cried Pippin, now thoroughly roused. 'Man! Indeed not! I am a hobbit and no more valiant than I am a man, save perhaps now and again by necessity. Do not let Gandalf deceive you!" 8. 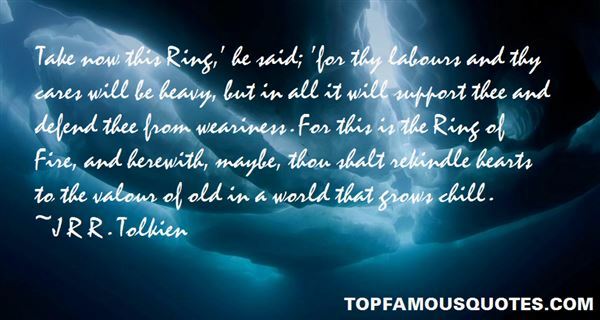 "Take now this Ring,' he said; 'for thy labours and thy cares will be heavy, but in all it will support thee and defend thee from weariness. For this is the Ring of Fire, and herewith, maybe, thou shalt rekindle hearts to the valour of old in a world that grows chill." 9. "The mind of man is capable of anything-because everything is in it, all the past as well as all the future. What was there after all? Joy, fear, sorrow, devotion, valour, rage-who can tell?-but truth-truth stripped of its cloak of time. Let the fool gape and shudder-the man know, and can look on without a wink. But he must at least be as much of a man as these on the shore. He must meet the truth with his own true stuff-with his own inborn strength." 10. "Toad's ancestral home, won back by matchless valour, consummate strategy, and a proper handling of sticks." 11. "I despised myself for my weakness. I may have dreamed all my youth of life as a horse-trader like my father; I may have railed against my conscription and loathed the legions on principle, but even so, every morning in this place I cursed my lack of valour and every night, when I slept, my traitorousmind brought me dreams drenched in the blood of our enemies as my comrades in the Vth launched themselves into battle, taking risks, winning glory, rising in the ranks, killing the enemy and so becoming men...all without my being there.The fact that it was winter, when the weather forced a kind of peace on both sides, and that my comrades were currently enduring endless forced marches over the mountains in western Armenia because their general had deemed them unfit for battle, did nothing to hamper my fantasies." 12. "That defense alone is effectual, sure and durable which depends upon yourself and your own valour." 13. "John Smith: Mankind doesn't need warfare and bloodshed to prove itself. Everyday life can provide honour and valour. Let's hope that from now on this country can find its heroes in smaller places. In the most ordinary of deeds." 15. "The wildest hath not such a heart as you.Run when you will, the story shall be changed:Apollo flies, and Daphne holds the chase;The dove pursues the griffin; the mild hindMakes speed to catch the tiger; bootless speed,When cowardice pursues and valour flies." 16. "Let me twineMine arms about that body, where againstMy grained ash an hundred times hath broke And scarr'd the moon with splinters: here I clipThe anvil of my sword, and do contestAs hotly and as nobly with thy loveAs ever in ambitious strength I didContend against thy valour. Know thou first, I loved the maid I married; never manSigh'd truer breath; but that I see thee here,Thou noble thing! more dances my rapt heartThan when I first my wedded mistress sawBestride my threshold." 17. "The merciless Macdonald(Worthy to be a rebel, — for, to that,The multiplying villainies of natureDo swarm upon him) from the Western IslesOf kerns and gallowglasses is supplied;And Fortune, on his damned quarrel smiling,Showed like a rebel's whore: but all's too weak:For brave Macbeth (well he deserves that name)Disdaining Fortune, with his brandish'd steel,Which smoked with bloody execution,Like valour's minion,Carv'd out his passage." Hikayatin mo lahat ng kakilala mo na magkaroon ng kahit isa man lang paboritong libro sa buhay nila. Dahil wala nang mas kawawa pa sa mga taong literado pero hindi nagbabasa."